*Took a trip to Ohio for my grandparent’s 60th wedding anniversary celebration. Enjoyed seeing all of my siblings and their children. We had 10 cousins there for Mikey and Davey to play with and it was quite an adventure- Mikey getting a bloody nose from his cousin and all! He even learned how to slide down the “fire poles” at the playground. *Dan and I celebrated our 6th year of marriage together. I love you Dan! *Mikey turned 4! Can’t believe how old he is getting. We had a weekend celebration in the cities at Como Town, Underwater Adventures, and Mountain Moose Mini-Golf. It was quite the celebration. *4th of July was celebrated with a yummy BBQ grilled up by Dan and fireworks in the backyard. We once again attended the firework show a few nights before during Rochesterfest (it rained on us and we watched the firework show in our ponchos, afraid that lightning might strike us any minute). We couldn’t believe they still did the show. We decided to just watch the 4th of July Rochester fireworks from our roof. Michael and David were sound asleep by the time the show started. We let David sleep and woke up Mikey who climbed out on the roof with us – only because we promised him we would wake him. *Dan’s Dad’s family came in town for a connecting flight to FL so we were all finally able to meet his family during the few hours they were here. We went to lunch at the Rainforest Cafe. July was also filled with a few trips to the pool and races at Soldier’s Field. They ran the 100M, 200M, 300M and jumped the long jump. Michael was too worn out after he saw how long the 400M was so we went home. *We purchased a new family van! So 3 carseats can’t fit in our little red Honda so we had to get something before the baby comes. We are loving our new “swagger wagon.” Dan has been on some crazy night shifts too, so I am so happy that we’ve had 2 vehicles so I don’t have to wake the boys up at random hours to take daddy or pick him up. *Went to the Olmsted County Fair and had a fun time seeing 3 hot air balloons on the drive over. I love how excited the boys get over the amusement rides and carni games (see Dan’s post for pictures). *Mikey attended a few summer camps. I think we only took pictures of soccer camp. The teacher was a young guy which reminded me of Steven, super laid back and chill. On the last day there was another lady teaching (as you might see in the pictures) and her class was completely different. Was an interesting contrast. Mikey also attended his first 2 community education classes. The four day “Animal Camp” was really fun for him, but his 4 day “Chinese Camp” didn’t go so well. He had a really hard time with me leaving him at preschool last year so I tried to keep up some type of time away from Mom throughout the Summer. The Chinese camp was the only one he really had a hard time with so it wasn’t a very positive experience. The teacher didn’t understand that I just needed to leave him although he was crying for me. But this year at preschool (we are doing a homeschool co-op again) he’s been doing great. He even asked me on his first day why I was walking him to the door. *Both boys attended a “Grow With Music” group which was 30 minutes once a week for 9 weeks throughout the summer. The teacher convinced me to enroll both David and Michael, as she saw how social David was compared to Michael. David ended up crying and crying the first 3 or 4 times, then did amazingly well. Mikey loved it and had no problems going without me. But when it came time for the parent’s to watch on the last day of class, Michael wouldn’t participate at all. What a nut. I can’t figure him out for the life of me. *And of course there was David’s 2nd birthday which has already been blogged about. He has so much fun with helium balloons. We often attend a local storytime and at the end they each get a balloon. Michael always gets a green one and David usually follows suit. *The boys have been having so much fun with the cute little neighborhood kids. We’ve been pretty much without kids in our community for the past 2 years, so now that 4 new families with children have moved in the boys love going outside and seeing which friends are out. Especially with school in session now, the kids love to go out and play every afternoon. The weather has been just beautiful- too bad I didn’t snap any pictures of everyone playing out in our backyard leaves the other day. Michael and David finally realized what it means to play in leaves. I don’t remember it being much fun with just the 3 of us last year as I tried to show the boys how to rake the leaves into piles and jump in. *Micheal’s first day of preschool, we took a trip up to the cities to a really fun “chutes and ladder” park. Both boys loved all the climbing and tall slides. David amazes me with no fear of anything. *Rochester had some heavy rain at the end of September which flooded the main street to our home, not affecting us at all, thankfully. Same thing happened a few years ago- and we realized the city had planned the flood plain for such cases. I took the boys down to look at the flooding and we had quite the adventure. While I was busy snapping photos the wind picked up and blew the stroller down the sidewalk and into the water. Michael ran after David and got his pants all muddy and wet. After the stroller was all secured, I went back to trying to grab a panorama shot. Next thing I know David is face down in the mud. He wan’t buckled securely and fell out. So, as the pictures show, he had some cool war paint on. Everyone who passed us thought we were nuts. *Michael and Dan took a little Father/Son outing to Silver Lake Park and took a paddle boat ride on the lake. It it a park just a few minutes bike ride away. *We took a trip as a family up the cities and had fun staying at a hotel,spending time at the Mall of America’s Nickelodeon Universe, butterfly exhibit, and took Dan to see the “Chutes and Ladder” park. I never knew the twin cities had so many beautiful places right within the city. Dan got quite a few nice portrait shots of the boys. *Preschool also took a trip to Apple Ridge Orchard again this year. So much fun. Last year Michael was with a group of 5 boys and 2 girls in preschool. This year there are 2 boys and 4 girls. He and his friend Jonas are great friends now (he was out of town on the day we went to the Orchard). I was just complaining about how long winter is getting and then this afternoon for just a few hours there was a beautiful, calm snowfall. I love it. I love the serenity of falling snow. Mikey and I watched it for a while (David was napping) and talked about going out, but never did. Mostly because underneath that thin layer of new fallen snow there are a few feet of ice. Playing in it really isn’t an option for now. I need to be better at enjoying the outdoors in wintertime. We did go out a few times this season. You might have even seen the video posted (on the right side bar) of our sledding adventure. I have to admit that the older I get, the more petrified I’ve been getting. Maybe it just has to do with my maternal instincts or something but Dan persuaded me to climb up this steep hill with Mikey and have a go. As much as I wanted to enjoy the exhilarating rush, after reaching the top I couldn’t get myself to go much faster than a turtle’s pace. I barely lifted my feet up. I just couldn’t do it. I imagined Mikey and I bouncing off some bump and crashing into the trees if I went any faster. Maybe it had to do with my watching a news clip the previous night about some kids getting concussions while sledding because the hills were so icy. I don’t know. But I know I never believed I would become such a scaredy-cat. Thinking back to September. Wow, let’s see. Michael started preschool with a little group of friends. He has been so loving it and bringing home all kinds of art projects and worksheets. They recently have been learning about bears hibernating, squirrels preparing for the winter, and something with bugs in logs. I’ll be teaching sometime early next year and am looking forward to it. We are doing the curriculum from Funshine Express and it seems to be working out really well. Their first field trip was to Apple Ridge Orchard, about a 15 minute drive from our home. They grow apples, pumpkins and grapes. We rode the big tractor/wagon ride up to the apple orchard and picked a nice big bag full. They were so nice and let us eat while we picked. If you’ve never tried our locally grown Minnesota Honey Crisp Apples you are missing out. Dan was even consider selling them the other day. They are really crisp and sweet. You can see both Mikey and Davey downed one or two while we were there. They also had a fun corn maze, which lasted a little too long, farm animals and hay stacks. Michael’s teacher had them fill out a cute picture of things they had to find around the orchard. You can see him in one of the pictures with the paper circling the picture of the llama. With all the siblings of the seven students and a few friends we had quite a group. Michael is so dramatic eating his apple in these pictures. We even captured his characteristic trait of picking his belly button in the picture on the right. After entering the corn maze I began having flashbacks of when I ran through a cornfield in Navoo, Illinois as a teenager and had an allergic reaction that lasted like 2 days. Miserable- red, puffy, itchy eyes. Thankfully I survived this corn maze with no reaction. I was so nervous. David had a wonderful time. This kid is always happy when he has food in his hands. He was playing in all the pumpkins, but wouldn’t look at me for the life of him. I finally got a few shots of him looking at me right before he had a nervous breakdown (he missed his morning nap). Feel free to browse our photo gallery for more orchard photos. I can’t overlook Dan’s birthday in September. Dan did manage to have the day off and in between running all his errands and studying he and Mikey put together his birthday present. There just seems to be some part of childhood brought out in each of us as we relive our childhood through our children. After finding an awesome deal on Lego City Dan decided it was just what he wanted for his birthday. He and Michael spent most of the afternoon together building this awesome Lego kit with a garage, 3 trucks and lots of other cool stuff that I really am not an expert at. I do think Legos are an amazing toy and fascinated how they are made- did you know their whole factory is run by machines 24/7? They have the whole floor wired mechanically and these robots package everything. Watched something with it with Dan on TV the other night- just fascinating! No wonder they never leave out pieces and even put in several extras of the little ones. Dan and I are impressed by their efficiency. So he and Mikey had fun putting legos together all day. Here’s the finished product. Totally amazing. I spent most of the day cooking up some tasty Indian food that I’d recently gotten recipes for. I cannot believe how long it took me to make. But we sure had a wonderful home cooked birthday meal. Dan’s not much for sweets so he left it up to me to make something I and the boys would enjoy eating for his cake. I thought Mikey would have fun making a dirt cake with me. The gummy worms were fun for him to put into the oreo dirt, but his favorite part was putting on the candles. He didn’t seem to intrigued with the concept of the dirt cake. Maybe he didn’t get what we were doing, or really wasn’t interested. He loved the cake though. David enjoyed eating the gummy worms. I love his face in this picture and the little spikey hair on the right. What a character. After we put the candles on, Dan was recording with the camera and passed it over to me and we sung to him video recording the whole time. It didn’t even dawn on me to turn the video off and snap a picture of him and his cake. Guess I tend to forget these things with 2 little kiddos demanding attention. We do love you Dan. Happy Birthday! October 12th brought with it our first snowfall of the year. Michael was in heaven and ran outside to eat a snowball, catch the snow in his mouth, and enjoy the first magical moments of winter. He’s so excited for snow…takes after his Daddy. Two days prior to this snowfall our friends invited us to go hiking with them at Carley State Park (like 20 minutes away). I’d been out painting our deck (which by the way is finally finished! Yea!) and so I realized how cold it was, but decided that a hike would be fun. I bundled the kids up in 2 layers, winter coats, hats and gloves. Somehow it feels like I just put those away not to long ago. Hmm. When the sun was out it was beautiful, but most of the time it was overcast. We were hoping for lots of pretty fall colors, and were a little disappointed that the park didn’t have too many colors to offer. Seemed like most of the leaves had already fallen. I do miss our hikes up the canyon in Provo- there’s nothing else like a scenic view from the top of a mountain hike. But the boys had a blast, Michael especially when there was water and stepping stones to jump across. He has to do everything himself these days. I could just see him slipping and falling into the frozen spring water, screaming and having no other clothes to put on. I love the top left picture here below of Mikey grabbing David in a huge bear hug. He’s learning to be a good older brother with all kinds of hugs and tackles these days. We got a few fun shots of David who happens to be in that stage of life where he looks anywhere but the camera for a picture. Dan did get some cute ones here of him smiling. He was so bundled up and excited to be out of the backpack. He really is such a sweet and fun boy. Towards the end of the hike there was a little park bench to rest on. David and Meghan who were on the hike with us grabbed a picture of our family and it actually turned out. Dan posted a gallery of all the pictures from the hike if you want to see the complete collection. I really do love fall. This early crazy snow and cold seems to have tapered off a bit now and the coats are back in the closet. Boys have been wearing jackets for most of the past month. We’ve had a few warm days to play out in the leaves and I’ll post up some pictures of that soon. I hear the high is supposed to be 64 degrees tomorrow. We might just have to go on a bike ride. It finally warmed up enough (to a whopping 20 degrees) to take the boys outside to play in the snow. Compared to the -18 weather we’ve been having it was relatively warm. We were hoping to make snowmen but it’s just too cold out. The snow won’t pack. Some day it will warm up enough. Instead we tried out our new sled. There just happens to be this perfect hill right in our backyard, thanks to the snow plow. Too much fun. Mikey lying in the snow- being the first time in many days, he was loving it. Mikey at the top of the hill waiting for the sled. He was actually smiling under there. I know, we are crazy. We put him down the sled with Mikey. I wasn’t planning on including this video, but uploaded it accidentally, so here it is. Dan pulling the boys back home. Mikey kept rolling off the sled after each run. I’m not sure why. He must have thought it was fun to land in. We actually did pack the boys up in the car a few days later to sled on an actual hill. The place we went actually has huge hills and in the summertime it looks so steep. For sledding, however it just wasn’t what we were expecting. We couldn’t get the sled to make it down the hill in one run. Bummer. From now on, we are sticking to our little backyard hill. Oh, and by the way, Happy Chinese New Year! Just a few pictures from around our house. I’ve gotten a little bit into gardening this summer. Here are the front walkway hostas, given to us by our neighbor, and evergreens which will hopefully add some color during the long winter. Lately a few of the spring flowers have budded again. Strange. Double impatience. Which does great in the shade but super wilts in the afternoon sun. Astatic lilies. Which were just beautiful in bloom. The sweet william was planted from seeds (thanks, Heather). Doing really well, but have yet to bloom. 2 lilac bushes which should bloom next Spring (behind Mikey). Hopefully preventing kids from falling down into the basement well. Mikey diggin up the rocks. Our little herb garden dried up and died before we could harvest it. I’ll have to try something else next summer… the herb growing wasn’t as easy as I thought it would be. I think it just got too much sun. And was I supposed to thin them out? I think that added to their death as well. Summer camping. How wonderful. One of our favorite things to do together as a family. Once Dan returned from China we were all set on going but it was just getting hotter and hotter outside. We were thinking we might not get a chance for camping during his remaining 3 weeks of break. However, on the last day of June there was a slight turn of the weather -night temperatures were forecast to be in the low 50s- so we packed up our little car and headed out for a night. Decided to head to Forestville/Mystery Cave State Park (which is about 45 miles south of Rochester). We found a nice little, secluded campsite and set up camp, then headed out to experience the Mystery Cave catching the last tour of the evening. The cave was, well, a cave. Interesting things to see, but not super impressively huge like other caves I’ve been to. Formation after formation and very educational. Seemed like something in a quaint, little town.. Which it was. We only saw a portion of the cave- it supposedly is one of the bigger ones out there but seen mostly through spelunking I suppose. Our little one hour tour was nice with only about 6 others in our group and a paved walkway for the stroller. Great for us and our little 2 year old. Dan took a million pictures so if you want to virtually walk through the tour (I think he got every inch covered) let me know and I’ll hook you up with all the pictures. Otherwise a few of the highlights of the cave are featured in the slideshow below. That evening we had a few raccoons visits our campsite. At least we think they were raccoons. It wasn’t the baby moving that kept me up, or the uncomfortable air mattress, it was these really strange grunting and wrestling noises coming from outside. Like all night long. Weird. Nothing of ours was ruined so I guess it’s fine. Michael didn’t hear them or see them but we told him about how they visited our campsite that night. A few nights later Dan told him a bedtime story about the raccoons. Now every night before he goes to bed he asks for Daddy to tell him the “raccoon story.” Dan recounts the events of the camp out and makes the raccoon family very adventurous. Mikey loves it. When we went to the Minnesota Zoo a few weeks ago, I think his favorite exhibit was the raccoons. Ironic. Post more about the zoo adventure later. For now, enjoy the pictures below from our little camp out. (Click on pictures to enlarge. For a full screen slideshow, after clicking on the picture, select the “Slideshow” text to the right of the picture -in Picasa under the “Download Photo”text). 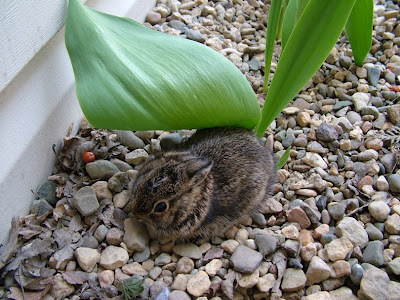 I had no idea what the furry thing was at first and thought it might be some scary dead rodent or squirrel, but as we looked closer we realized it was a baby bunny. 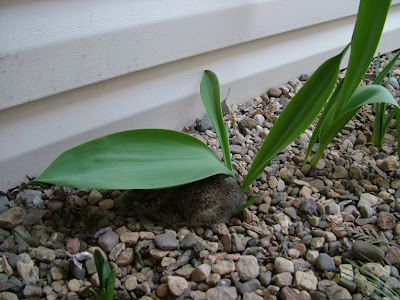 It had curled up underneath one of the tulip leaves. He just laid there until Dan nudged him with the broom. We tried feeding it some greens, but I don’t think he ate any of it. Might have been too tiny and still on the milk diet. Michael was so cute and after I told him the bunny was scared, he kept saying he was scared too. He was really interested in it until it started hoping towards him. Then Michael just ran into the house saying “scared.” So cute. I was a little worried about the bunny after he was still sitting among the flowers that evening, but the next morning he was gone. Hope he found his way back home. I can’t help thinking this is like some little story out of a picture book though. 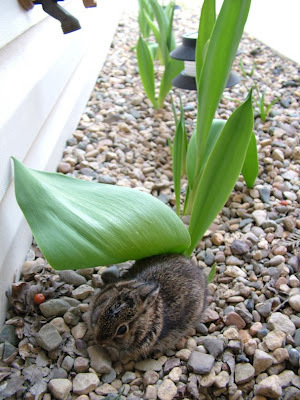 A bunny in the tulip garden. No wonder where they get their ideas. And as we were eating dinner out on the porch tonight, we happened to see about 7 bunnies hopping around and chasing each other; running back and forth across the street and into the little woods next to the bike bath. Really fun. I’ve never lived anywhere with wild rabbits. Michael loves it along with the rest of us.